On a tight budget? Not a problem with our guide to the best Christmas presents under £25. These gifts are so gorgeous, your loved ones will never know they cost so little. Find more Christmas gifts and decorations on our dedicated hub page. 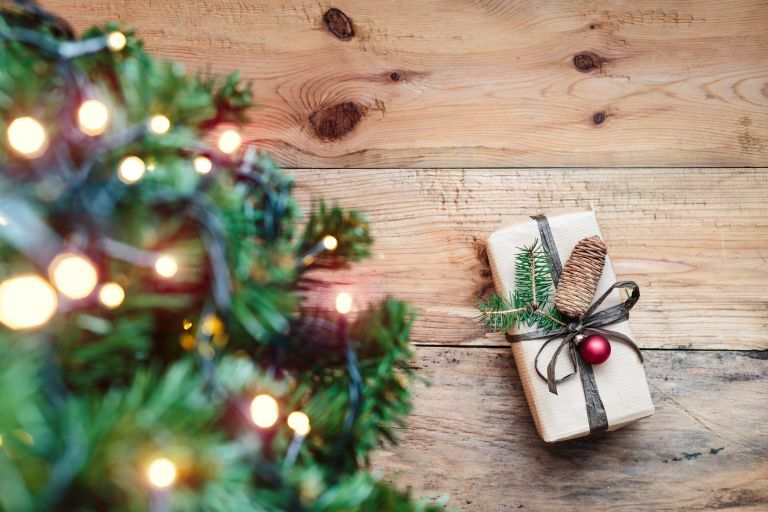 And, take the legwork out of your Christmas shopping by checking out the Real Homes team's top 50 Christmas gifts for 2018: we want them (and so will you and your friends and family). Help them travel in style with The Perfect Pouch by Katy Loxton. Practical, but as pretty as a mini handbag. Perfect indeed. Find more fab gifts for travellers in our Christmas buyer's guide. The Spiced Orange set of tealights by Beefayre are deliciously scented and have the added benefit of being an eco-conscious gift, since the company donates part of the profits to bee conservation. Find more gorgeously scented Christmas candles in our buyer's guide. Cushions are a time-tested, fail-safe home gift option. No one can ever have too many, so you can't go wrong by buying them another. The Constellation Cushion from Oliver Bonas has the added interest of an astronomical print and a trendy teal colour. Find more fab gifts for home lovers in our Christmas buyer's guide. We can't get enough of the whimsical and colourful Egg Cups from Hannah Turner. A gift your recipient didn't know they needed – but will absolutely love. Continuing the kitchen/foodie gift theme, the Sardine Oven Glove from Thornback & Peel are very luxurious, but, at just £25, still very affordable. Find more great foodie Christmas gifts in our buying guide. It's hard to think who this gift wouldn't appeal to. Perfectly seasoned tequila shot, in stunning-looking shot glasses? Oh yeah. The Himalayan Salt Shots from Firebox are style and substance, literally. Succulents are the trendiest of plants, and we can see why. Easy to care for and coming in lots of variations of shapes and sizes, they look great in any room. The Succulent Terrarium Diy Gift Kit will appeal to anyone with green fingers. Find out how to use succulents to make a crazily fab Christmas wreath. Pretty and useful, the Saskia Salt & Pepper Shakers from Oliver Bonas are a delight, whether you are a cat lover or no. We know we would say this but Real Homes magazine is a fab read – as well as being a great reference for anyone looking to transform their home. A subscription means you'll have all the latest on updating your home, whether owned or rented, and whether you're on a budget or splashing out on a forever family home. Cute and very affordable, the Alpacas set of three hand creams from Cath Kidston will make a great stocking filler. Many, many more stocking fillers can be found in our Christmas buying guide. And if all else fails, why not give them a teapot? It doesn't matter if they're a tea connoisseur or just have a massive bag of PG Tips in the cupboard, everyone loves pouring a cuppa from a nice teapot, especially when there are guests in the house. Our pick is the stylish and urban Ivory Earthenware Teapot from Maisons du Monde. Are they into their candles and tealights? Give them a tealight holder that's a cut above average. The Sorbet Tealight Holder from LSA International is super chic and modern, with its delicate sepia tone and gold rim. So pretty that it will work on its own as a coffee table ornament, too. Now, they don't have to be a foodie to enjoy this gift (although it really is a perfect gift for a foodie if they are), or even have a particularly sweet tooth. These Chocolate Truffles from Charbonnel & Walker are so sophisticated and delicious that they are guaranteed to delight even the pickiest of friends and family. And there are so many flavours to choose from (afternoon tea flavoured truffles? Kir Royale flavoured truffles?) that you can really taylor this gift to their preferences. To say nothing of the gorgeous packaging. We love them, go buy them. Nothing cheers up a room like fresh flowers – why not give them some that will last longer than a few days, and, crucially, beyond Christmas (think those cold and dark January days)? The White Christmas Indoor Rose Planter by Tree2mydoor is dispatched with roses in bud, and will last five to eight weeks. There are dinner plates and there are dinner plates that will make them imagine they're dining in a fancy Parisian hotel. The Bourgeoisie range from Maisons du Monde looks absolutely fabulous, and they'll never guess it's so affordable. A set of two dinner plates/two soup bowls is £14.38, and a set of two dessert plates is £13.66. Not bad at all for such exquisite tableware. What could be a nicer winter gift than a hot water bottle? Pick them a fluffy, luxurious one, like the Ice Grey Hot Water Bottle with cover from John Lewis.